Sri Guru Nanak Dev Ji is credited with starting the Sikh religion. He was the first Guru of the Sikhs and is worshipped next to God. His sole aim in life was to unify the Hindus and Muslims and form a universal religion of brotherhood and compassion. He believed that true salvation could be achieved only by devotion of thought and excellence of conduct. In the contemporary world, Sikhism is spread far and wide in not just India but also America, Africa, Europe, etc. The life history of Guru Nanak Dev is very motivational and inspiring. 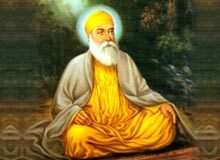 We give you a short biography of Guru Nanak Dev. Born in a middle class family on April 15th, 1469, Guru Nanak was born in a village called Talwandi, situated in what is the present day Pakistan. The place is now known as Nankana Sahib and is located 40 miles from Lahore. His father was an accountant named Kaluchand and his mother's name was Tripta Devi. When he was born, an astrologer prophesized that he would grow up to be a spiritual leader and was blessed by God. He would attain much fame and glory and would be worshipped by one and all. When he was five years old, Guru Nanak spoke in detail about God and his spiritual existence much to the surprise of others. By the time he was fifteen, he had mastered Hindi, Persian, Punjabi and Sanskrit. But one thing that stood out was his unquestioned love for God. His way of life started to worry his father who decided to teach him some business. Once, he gave Nanak Rs. 20 and told him to start a business in Lahore. While on his way to Lahore, he met some meditating sadhus who had not eaten for days. He spent the amount to give them food. Upon his returning back, his father asked what he had done with the money. He said he had done his true duty and told him that he fed hungry souls. Next, he was sent to a grain shop to work. He spent his entire earnings on the poor and deprived and never kept anything for himself. He got married when he was 18 years. But he left his domestic life for a higher calling and to quench his thirst for spiritual knowledge. He preached that God was omnipresent and did not adhere to any kind of ritualism or worship patterns. He led a life of purity and clarity and believed that the attainment of enlightenment would relieve one from the cycle of birth and death. He visited many places to preach and spread his knowledge, which includes Burma, Iraq, Tibet and Sri Lanka. Guru Nanak composed a set of poems known as "Japji" that is recited as the Morning Prayer. It forms the first chapter of Guru Granth Sahib, the holy book of the Sikhs. These thoughts and poems inspire many till date and are considered the epitome of good living.